A few days back Apple released iOS 10 beta for developers. If you have a developer account, you can check this out on your iDevice. As like others, every beta program is buggy, and this one is a little bit more. So, I’ll show you how to downgrade iOS 10 beta to iOS 9 without losing data. Apple’s public iOS 10 beta release is expected in July, at which point it will be made available to anyone looking to try it out. Many people don’t like the latest beta released on iOS. The features are impressive, but they don’t like its performance. It isn’t up to their standards, and they want to go back to iOS 9.3.2. The downgrading method is comparatively easy, so if you have had completed testing iOS 10 beta or are just done with the bugs, you can quickly return back to iOS 9 on any iPhone, iPad, or iPod touch. Some prerequisites are needed to perform this task. You need a USB cable for your iPhone or iPad to connect to the computer and the latest version of iTunes software installed in the Mac OS X or Window. First, you all need to download iOS 9.3.2 IPSW file for your iPhone, iPad or iPod touch on your computer. The device model must match the IPSW for the downgrade process, or else you will get an error in iTunes. Then, launch iTunes on your Mac or Windows computer and connect your iDevice to the computer with a USB cable. After that, choose your device and go to the Summary page. 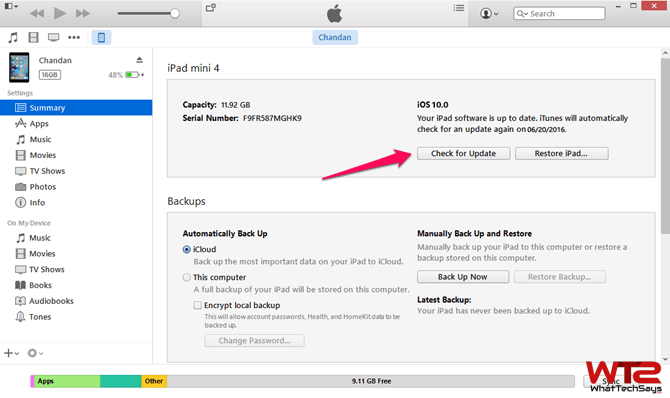 Here you’ll get two options; Check for Update and Restore. On the Mac OS X, press OPTION + click the “Check for Update” or if you on the Windows, press SHIFT + click the “Check for Update” button. It’ll open a window to select the download IPSW on your computer. Just select it. It’ll pop up a confirmation window. You just need to select “Update” button to downgrade iOS 10 to iOS 9 without losing the data. If you want a clean install of iOS 9.3.2 on your device, follow the same procedure and choose the “Restore” button rather than “Check for Update“. Once the downgrade has finished, you can restore from a backup created earlier. This is the procedure on how to downgrade iOS 10 beta to iOS 9 without losing data. In some rare cases, this might not work, and you might get an error, but you know this works for me every single time. Try this today and don’t forget to share your experience. This method completely wipes your SMS data and Call History!!! You should make this part clear in your post. What about the “Beta Profile”? Should this be deleted or do we just leave it?